For some residents of drought-stricken Cape Town, the prospect of the taps running dry is almost too much to bear. 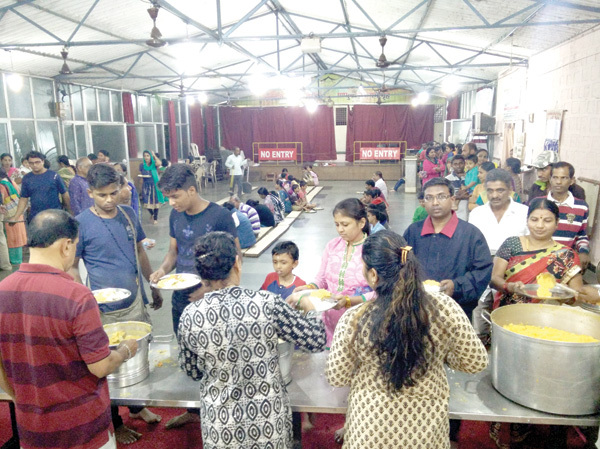 Come Tuesday evening and devotees make a beeline for the Shri Ganapati and Murugan Mandir housed inside the Aiyar family compound at Aquem-Baixo, Navelim. The reasons are two-fold - the weekly aarti and free supper which is offered to all visitors to the temple. On an average around 2000 people enjoy the sumptuous, vegetarian meal served every Tuesday evening inside the temple complex. The brainchild of Maruti Aiyar, a retired banker and managing trustee of the temple, the Tuesday supper project began ten years ago, driven by the temple Trust. However, very soon, it caught the fancy of the devotees who offered to contribute their mite for the same. This led Aiyar to devise an innovative scheme, where even a modest Rs 100 donation is accepted as contribution towards the Tuesday supper fund and utilised for the same. A chart in the temple indicates how people can contribute amounts ranging between Rs 100 and Rs 15,000 (for the main sponsor) for this community supper. “The idea is to involve people from all strata of society. By allowing all sections of the society to contribute, we create a sense of ownership and belonging to the temple and the weekly community meal. Interestingly, even if a local politician or prosperous business person wants to contribute more, he/she cannot exceed the limit of Rs 15,000 and would need to wait his/her turn. This way, there is a feeling of equality and community sharing that we have been able to inculcate in this free meal project,” Aiyar said. A visit to the temple is a very pleasant experience. If you are coming from the Rawanfond circle in Margao, you go past the Signals’ Military Training Regiment gate and take a left turn to enter the narrow lane leading to the temple. There is a parking lot for ten cars adjacent to the temple, which is situated at the dead-end. When this correspondent visited the temple last Tuesday evening, devotees were singing melodious bhajans, while others were paying obeisance to the twin temple deities. According to Aiyar, this is first temple in Goa which houses the twin deities of Ganesh and Murugan (Lord Ganesh’s brother) inside one temple and the only Murugan temple between Mumbai and Mangalore. The aarti is performed by the main sponsor of the community supper, following which hot meals are served in the large hall adjacent to the temple. It was nice to see people from all walks of life and varied age groups waiting patiently to be served. People either sat on comfortable tables and chairs in the lawn area of the compound or on the floor. The genesis of the temple and the concept of feeding people was sown by Aiyar’s late mother, Annapoorni Aiyar in the late 60s. The late Annapoorni, a devout lady, used to serve water to devotees at both the Zambaulim and Chandreshwar Hill temples for several decades during every big festival. This motivated her to begin constructing the Ganapati-Murugan temple in Navelim in the late sixties. Thanks to some robust help from philanthropists like the Late Ramakrishna Salgaocar, the temple saw the light of the day in year 1970. According to Aiyar, his mother believed that feeding people was the most noble act. As a result of which, free meals during key festivals became a norm at the temple. Today, the temple trust also runs several social service schemes for the people in the neighbourhood. The temple complex houses a health and acupressure clinic managed by visiting doctors, a child and family counselling centre, a Sunday science school for children and classes in Bharat Natyam, Hindustani classical music and Karate. The temple trust is managed by Aiyar, his wife Shanta, also a retired banker, their sons, Kartik and Ashwin and close relatives. As we sit and chat in the Aiyar sitting room, one can sense a deep sense of contentment inside the home. I ask Aiyar, if the temple has something to do with this. He agrees, saying the temple was the centre of their existence and that their Trust helps several social causes like education and health and have sponsored several cataract surgeries, besides constructing classrooms in a local school. The DRONACHARYA of GOAN BASEBALL!